or, Let the observers observe! The last 24 hours were awful for the National Electoral Council. In the middle of a politically explosive process to verify the several million signatures backing the opposition’s request for a recall referendum against Chavez, the council now faces some very serious allegations. One of the five board members, Ezequiel Zamora, went public with allegations of sabotage in the signature verification process. He claimed “some” CNE verifiers had excluded authorized personnel from the “physical verification process.” Somewhat cryptically, he said “the percentages are not coming out properly.” He was careful to keep politics out of his statement, but it’s not hard to fill in the gaps. He said the problems could delay an already delayed decision and demanded that CNE staff follow the board’s directives strictly. The gravity of these allegations hardly needs to be stressed. Mature leadership is desperately needed to steer CNE out of this mess – the alternative is too volatile to even consider. Can they work this out internally and come up with a solution that rescues the organization’s credibility? CNE chairman Francisco Carrasquero claims the whole thing is a big misunderstanding. I hope he’s right. Even if he is, he should learn from this snafu and allow the international observers unfettered access to every part of the process. When observers are not present, it’s easy for “misunderstandings” to generate a huge amount of suspicion that can be deeply damaging to the whole process. Especially if the accusations are false, Carrasquero should realize that the ONLY chance he has of convincing the world that CNE procedures are clean is by letting Carter Center/OAS watch everything. It’s significant that it was Ezequiel Zamora blowing the whistle in public. A nominally opposition-minded member of the council, Zamora had surprised everyone with his spirit of negotiation and bipartisanship. He’s joined the chavista majority on more than a few votes, yielding a lot of 4-1 votes instead of the 3-2 decisions conventional wisdom had expected. 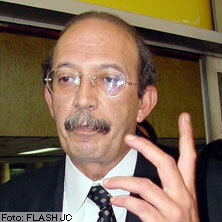 Zamora may not like Chavez, but he’s far from an opposition radical, far from a loose cannon. His statement was meant to bring staff into line, to keep the process transparent, not to throw it into crisis. One other crucial decision remains on the council’s plate. The matter of how much access Carter Center/OAS should have to the most critical stages of the verification process has yet to be discussed officially by the board. Much hangs on this decision, which could come as early as Tuesday. My feeling is that the government fears close international observation more than anything else, because it would make the task of obstructing the referendum that much more difficult. It’s disheartening that Chavez die-hard Congressman Nicolas Maduro went public hours later to accuse the OAS of imperialism for its request to observe every part of the process. This speaks volumes about how effective the observation mission has been in dissuading foul play. And it puts renewed urgency on the call for CNE to allow observers into every nook and cranny of the entire process. The council will need to make some hard choices in the hours ahead. To exclude Carter Center/OAS observers from parts of the verification process in this climate is a recipe for disaster. If the board wants to retain its credibility, it must conduct all procedures in broad daylight in front of credible, experienced observers of unquestioned credibility. A thumbs-up from the Carter Center/OAS mission is the only way to keep an eventual decision credible to all parties. Jimmy Carter did not spend half his adult life chasing a Nobel Prize only to squander his credibility at the last minute by signing off on a bogus election process. This, right now, is the epicenter of crunch time. The country needs responsible leaders to take it through this very difficult juncture. If the provocateurs get their way, this little crisis could derail the referendum process altogether. This would really be a catastrophe. The CNE Board has to take stock of the historic responsibility of the moment. It must understand that unfettered observation is better for both sides. If I’m wrong and the signatures really are bogus, as the government claims, it’s especially in the government’s interest to have impartial observers in hand. CNE’s decision to strike down the referendum will only be credible in Venezuela and the world if an institution like the Carter Center certifies the process that determined they are fake. Otherwise, nobody will believe them. These are the kinds of situations that separate heroes from villains, people of integrity from opportunists. CNE must step up to the plate. Because the tag-line on this blog is dead serious. Venezuela really is teetering on the edge of a civil war, and killing the recall through opaque back room maneuvers in the absence of international observers would be an excellent way to push the country over that edge.